Now this is something I’ve been wanting to write about for a long long time. Yes as the title suggests- I’m a left-hander, so are a few of my cousins and friends and so is atleast 10-12 % of the World population. “Why did your parents not correct you in your childhood, seems to me like they didnt care about you at all..”- This happened quite recently and bugged me very badly. The lady didnt probably mean it to sound as bad as it seems but it somehow upset me for a bit, got me angry, but mostly firmed up my resolve to educate people about left-handedness if they haven’t heard about it at all. For one-if You haven’t heard of left-handedness, it’s your ignorance. But to say something like My parents didn’t care- well that is nonsense. In fact, mom and dad were careful enough to see which hand I used more when picking and dropping things, or to hold something firmly etc, and while most Indian parents would have scolded the child and forced him/her to switch to the right, They only encouraged me to use the left, and looking back I’m very very thankful to them. Several Studies have proven that forcing a child to switch from left hand to right hand can cause a lot of confusion in the kid’s mind which can at some stage even lead to learning disabilities and a whole host of other problems. 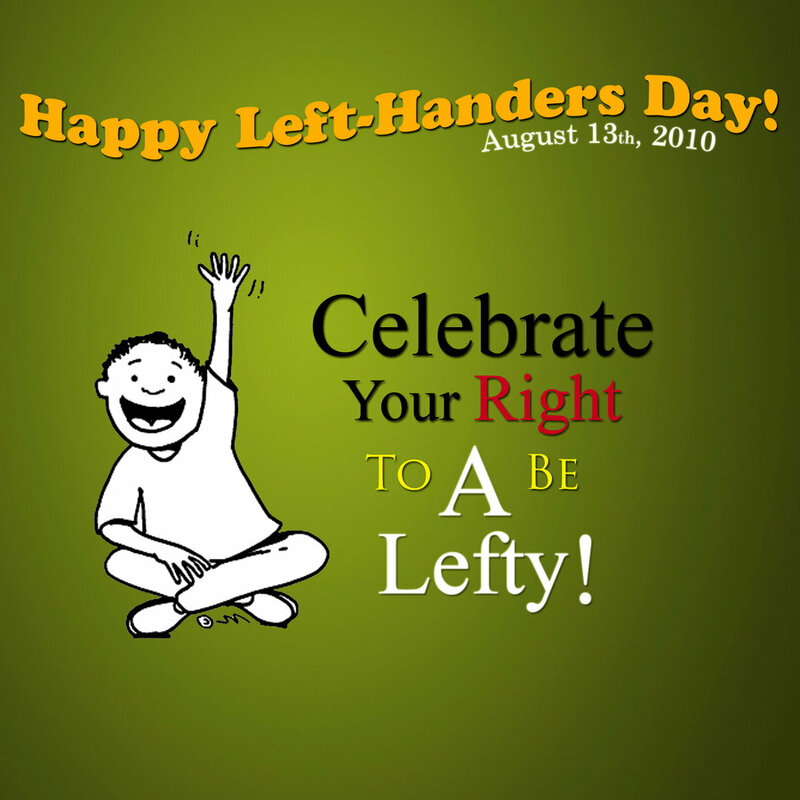 These days there is increasing awareness and World left handers day is celebrated on August 13th for the same cause. 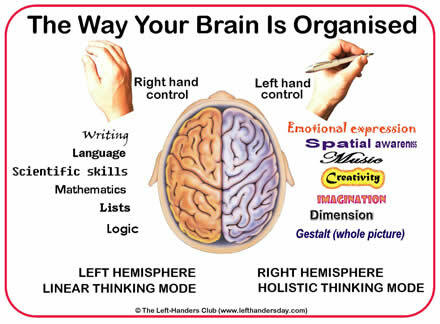 left handers primarily use the Right side of the brain whereas Right-handers chiefly use the Left brain. Right brain thinking is generally associated more with Creativity and Imagination whereas the left hemisphere is associated more with logic and reasoning. Thus we’re basically programmed differently right from our manufacturing process and so we shouldnt be forcing left-handers into using the right. For all the left-handers reading this-Just Be the way you are 🙂 and if anyone ever asks you anything ridiculous Stop them and explain to them that god made you this way and the difference between them and us. And if you’re right handed Accept that left-handers are also perfectly “Normal” people who can write at the same speed or even more than you. And that We can do everything else you can too-just that we use the left over the right. Thats it for now- but I’ve got a few more left-handedness posts coming up-Lots to write about :D.
« First month of vacation..